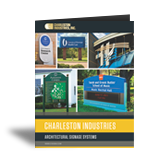 For those signage applications where information on a wide variety of subject matters is required, the Charleston Manufacturing, LLC exterior directories and readerboards are the perfect option. Available for use in either illuminated or non-illuminated configurations, the Charleston Manufacturing, LLC exterior directories and readerboards are custom made to suit your particular application. Units can be configured as either single or double face, and can be manufactured with a variety of message media from corkboard to changeable sign letters. 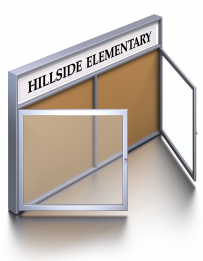 All units can be either anodized or finished with our standard acrylic polyurethane finish. All Charleston Manufacturing, LLC exterior directories are built to stand the toughest outdoor environments. They feature the same durable extrusions you have come to expect with all Charleston Manufacturing, LLC products. In addition, all units feature weather resistant aluminum backing with silicone sealant and requisite ventilation. 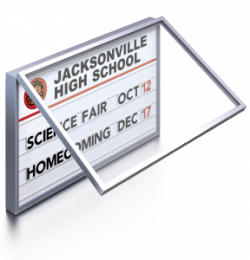 A readerboard is a visual display board that conveys information about a wide variety of subjects, including advertising for products or services, travel, news or event information. 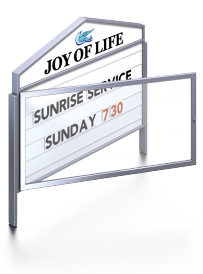 While traditional readerboards often use simple block letters that must be physically manipulated to change the message, many modern versions use LEDs that may be instantaneously updates to reflect changes to the information displayed.